I found it somehow telling that the debut of the new season of Mad Men coincides with buzz around a party that showcases just how low today's Mad Men have fallen. Ad men, back in 1962, were a pretty good catch. They made what my grandmother would call “a very nice living,” certainly comparable to that of other white collar professionals like doctors and lawyers. Advertising was considered a glamorous profession and working for an agency made you sort of a big deal. 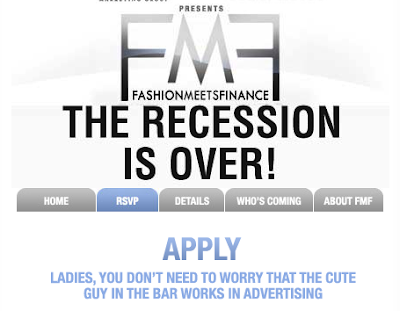 How that’s changed is best seen in the above promo for a much-reported-upon party called “Fashion Meets Finance” whose goal is to introduce women in the fashion industry to men in the finance industry, because… well, because guys in finance are rich and successful. That’s a long way from Don Draper’s reality, where gold diggers considered ad men fair game and a reflection of where our business is heading. You can see it in Erik Proulx’s excellent documentary Lemonade (check out the trailer here) about how laid off ad people are making new lives for themselves in fields only tangentially related to the ad business. And it’s not, as some blog commenters have suggested, because they weren’t really committed enough—it’s because the industry they signed up for doesn’t exist anymore and the jobs and skills they had no longer carry the sort of prestige and salaries they once did.